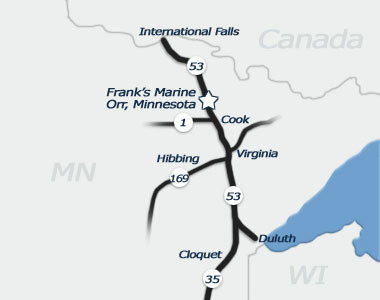 Frank's Marine Sales & Service Inc. is an established business that has been family owned since 1979. Located in Orr, Minnesota on Pelican Lake, with easy access right on Hwy 53 serving northeastern Minnesota, including Intl. Falls, Kabetogama, Ash River, Crane Lake, Lake Vermilion, Virginia, Hibbing and surrounding area's. Our theme has always been quality sales and service going that extra mile to provide customer satisfaction. We have always focused on excellent service which we are known for having great mechanics, to offer excellent service after the sale, treating our customers with honesty and respect. What we offer: The sale of Mercury outboards, that is all we have ever sold, we know them inside and out. The sale of Lund and Crestliner boats powered by only Mercury outboards and Mercruiser Sterndrives. The sale of Shoreland'r Trailers.